Here is the setup I use for holding a dulcimer on it’s side. I briefly mentioned this clamping method in a recent post about using a spokeshave to bring the top and back flush with the sides. I was scraping the sides of this dulcimer and saw a photo opportunity to show a little more detail about the clamping setup. I use two cabinetmaker’s clamps clamped to a work-board. By clamping only one jaw of the cabinetmaker’s clamp the other jaw remains adjustable. Before using this setup I would hold the dulcimer between my knees and under my chin. 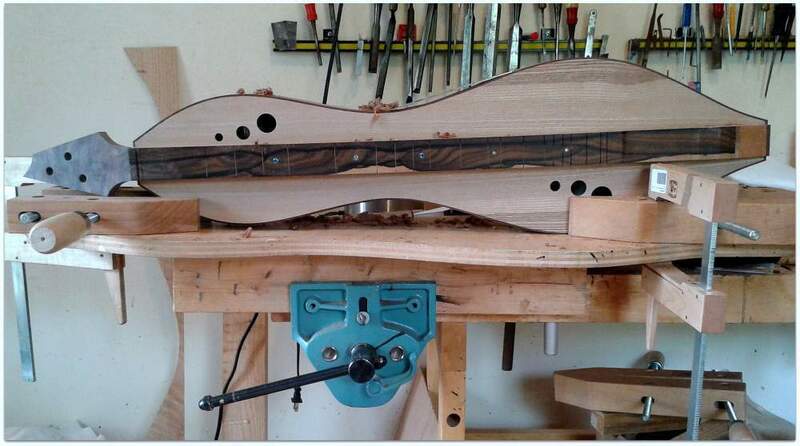 This method worked well but clamping is a little easier on my body and does hold the dulcimer more solidly. I occasionally consider making a dedicated fixture for holding dulcimesr on their sides; something along the lines of a Moxon vise, but the cabinetmaker’s clamps work fine and I prefer to have fewer tools with multiple uses than multiple tools with fewer uses. Beautiful dulcimer! What are the woods on it? Thanks for the kind words, Susie. The top is Sassafras, the fingerboard is zircote and the peghead veneer is walnut burl. the binding is bubinga and the body is curly walnut.